"Suddenly, life was more than French fries, gravy, and girls." 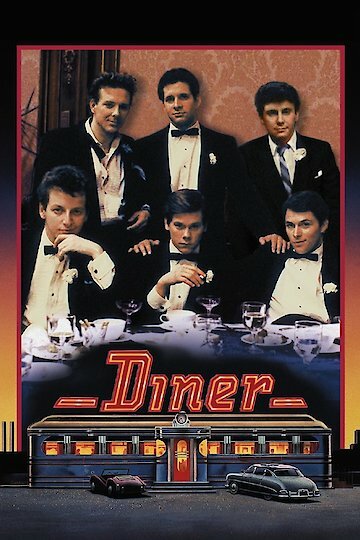 The 1982 film Diner was Barry Levinson's first feature, and it tells the story of a group of male friends who come together for a wedding in 1959. The main characters are played by Steve Guttenberg, Daniel Stern, Mickey Rourke, Kevin Bacon, Tim Daly, and Paul Reiser. Shrevie, Boogie, Timothy, Eddie, and the others deal with growing up, starting their careers, and becoming responsible family men. Ellen Barkin co-stars as the wife of Stern's Shrevie. The couple are already having communication problems. Guttenberg's Eddie, who is scheduled to get married on New Years Eve, is making his bride pass a test about the Baltimore Colts. Dramatic and comedic events pepper the film as it explores the idea of arrested adolescence. Levinson set the film in Baltimore, his hometown, and intended it to be a semi-autobiographical portrait of the region and time period. Diner doesn't follow a linear story structure. Instead, it mostly consists of vignettes that give insight into the characters' lives. Diner is currently available to watch and stream, buy on demand at Amazon, Vudu, Google Play, FandangoNow, iTunes, YouTube VOD online.